It's a sigh of relief when someone comes a long and takes a place that is socially acceptable to be...drab, and turns it into something beautiful! And lets face it, parking structures are most often just plain ol' slabs of concrete that smell like exhaust! We all have to use them, so lets make them great! Right? Our Weekly Roundup is here to celebrate those who want to show the world a different perspective on parking garages. Peter Kunz Architects built this stellar parking structure where each spot is like a private cubby with a large glass panel, so you can park and enjoy the hillside view at the same time! Teresa Sapey Estudio de Arquitectura built this concrete parking structure in Madrid. The team used fresh color gradients and graphics to direct drivers and help them remember where they parked. Teresa Sapey Estudio de Arquitectura took a bright approach to this garage as they use bold colors a way to find your car! No more getting lost, if you can't remember you parked in the green zone, there is something majorly wrong!! Bjarke Ingels Group (BIG) Architects built this colorful open parking space called The Mountain, in Copenhagen. The shining garage sits about a residential apartment complex, and offers parking to 419 residents. Herzog De Meuron recently built this parking structure in Miami over a newly developed retail space. The structure is monolithic, modern, and angular in its beauty. The interior of The Mountain parking garage in Copenhagen, finely constructed by Bjarke Ingels Group (BIG) Architects. The architectural team used color changing methods to add interest to the space. Emmanuel Combarel Dominique Marrec designated the ground floor of an historic Parisian building to a small parking garage and added a contemporary vibe to it during the redesign of the unit. 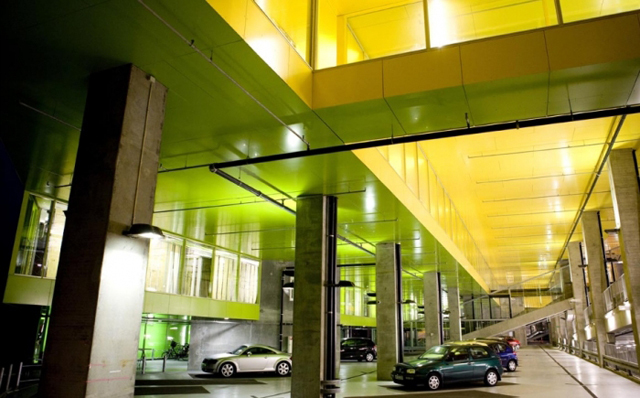 The team incorporated grass and bushes along with decorative lighting into this parking garage! The top level of Herzog De Meuron's Miami parking structure which gets drivers out of a smoggy closed structure and onto a breezy rooftop. In this garage, built by Teresa Sapey Estudio de Arquitectura, pictograms, various color, and numbers are used in an aesthetically pleasing way to let drivers know they can charge their electric car here. 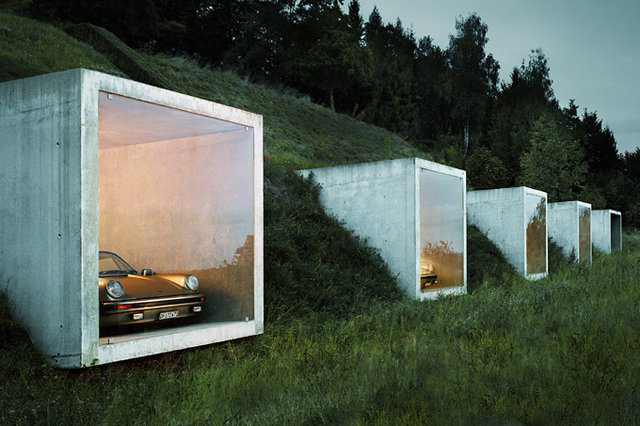 HHF Architects created this underground parking structure in Switzerland. The angular columns and beams along with the high ceilings are just a few architectural elements that make this garage beautiful.